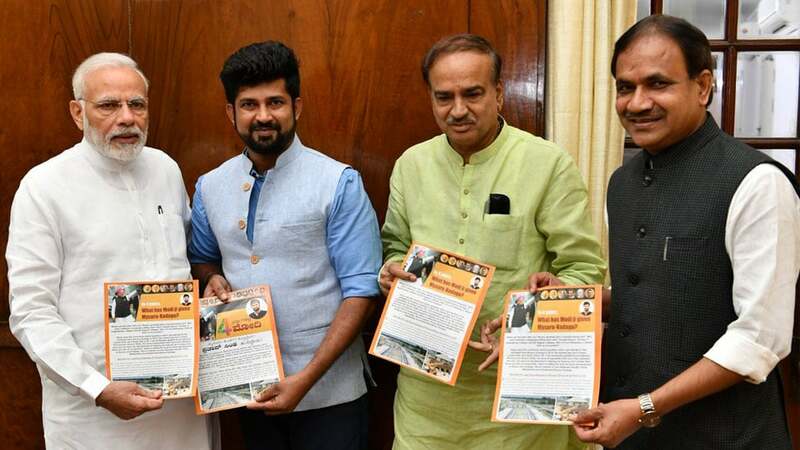 Prime Minister Narendra Modi seen releasing the achievements booklet of Mysuru-Kodagu MP Pratap Simha in New Delhi yesterday. The booklet, titled “Saaf Niyath, Sahi Vikas” (clean administration and right development), lists out the Rs. 11,000 crore grants that has been sanctioned to Mysuru by the NDA government. Various development works including road, railways and airport have been initiated by Pratap Simha in the Constituency. Union Minister H.N. Ananthkumar and Bidar MP Bhagawan Khuba are also seen. Can’t stop Wondering how Prathap Simha gets Modi’s appointment so easily compared to any other leaders from Karnataka? Looters of India posing together!missing Malya and Nirav Modi, as our esteemed ex PM put it, legalized plunder and organized loot! Can’t wait for their turn to end and restore democracy!